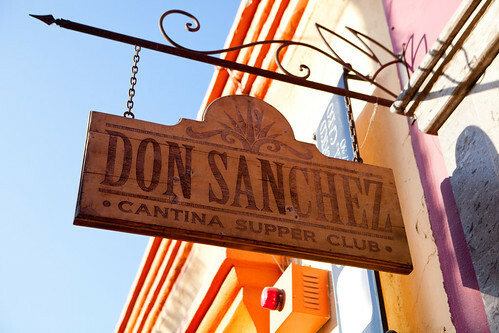 Don Sanchez is a casual restaurant located in the historical downtown district of San José del Cabo. 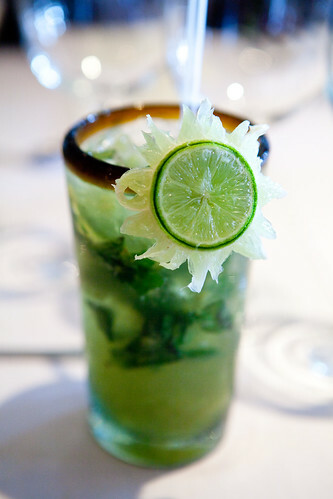 Corporate Chef Tadd Chapman, a Canadian expat and tequila expert, cooking casual food that is tilts toward the finer side of Mexican cuisine. 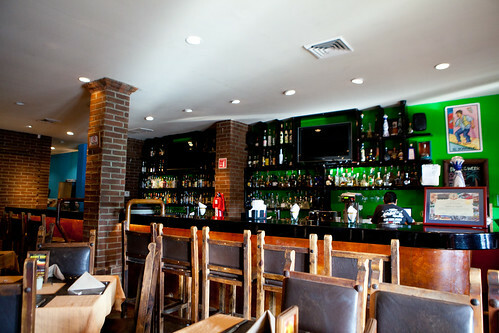 This restaurant is also known for evenings of salsa dancing, which diners may partake if he/she is around late enough to take part of the fun. 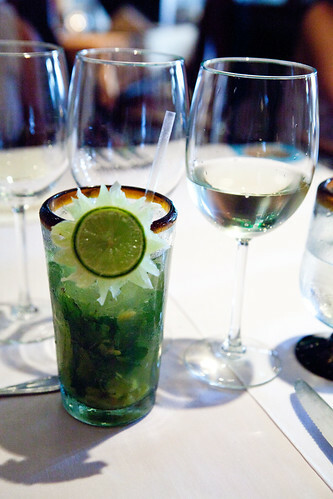 Excited for this wine-paired meal, we started with their refreshing and very delicious pineapple mojito. It’s fruity but not too sweet, which I prefer for my cocktails and the sun-shaped lime cocktail garnish was the talk of the table. 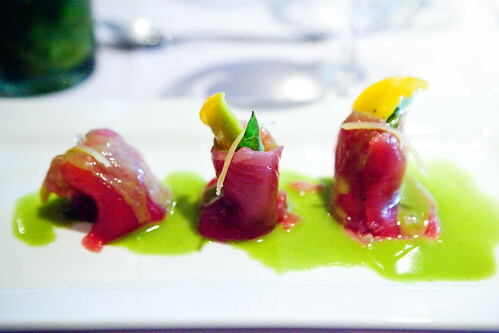 For the first course, we had tuna tulips. Medium-thick ribbons of sashimi grade tuna wrapped up slices of fresh mango, basil, avocado, and thread-like slivers of lemon zest topping the creation. Each “tulip” were mostly silky bites of soft and creamy textures with a subtle sweetness. The basil vinaigrette added a slight herbaceous, bright flavor. The wine pairing of JC Bravo Palomino 2011 is a crisp, dry white with plenty of fruit aroma went really well with this dish. This winery is located in Valle de Guadalupe region and supposedly hard to come by as it’s produced in limited quantities. 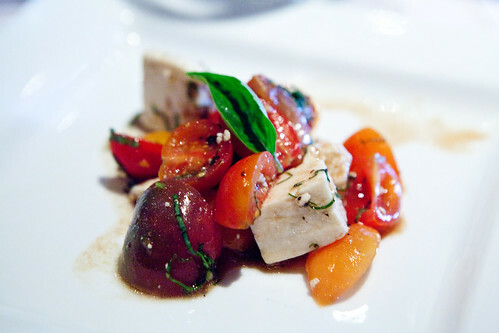 The Cabo Caprese salad comprised of baby heirloom tomatoes, local cheese (it tastes similar to feta), and fresh basil was a welcoming dish for me. It screamed summer and seasonality that I craved and missed while eating through parts of Cabo. The wine paired here was the Piedra de Sol Blanco Chardonnay 2011 it has no oakiness but there’s citrus and apple aromas. It’s a very crisp, low-bodied wine with fresh acidity. It works as it doesn’t intrude on the wonderful freshness of the salad. The Black & White hamachi gets its name from the black and white sesame encrusted fish. 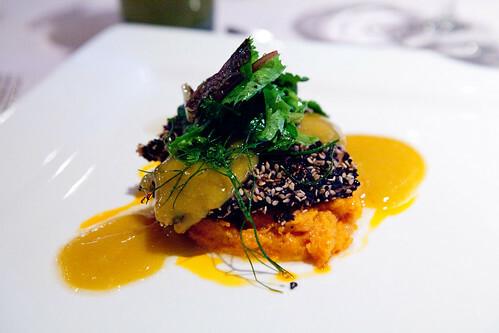 It sits on a bed of sweet potato purée with a drizzling of mango coulis. This dish was trying to be interesting but I wasn’t too fond of the dish because of the inherent sweetness sweet potato purée adding on to the mango coulis’ sweetness. I did like the hamachi and sesame crust portion though, as the slightly crisp and nutty flavors worked for the fish. This dish was paired with a very young but quaffable, crisp Roganto Sauvignon Blanc 2010. 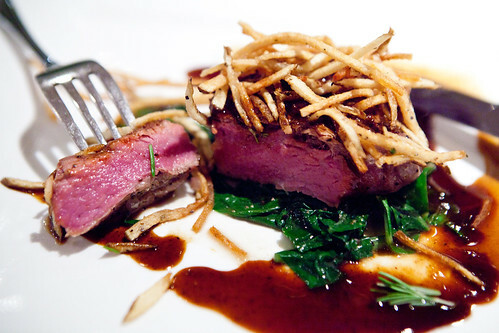 The final savory course of the evening was a generous portion of grilled filet mignon sauced with rosemary mole and topped with wispy pomme frites and a side of Swiss chard. I ordered my steak rare, which came out the way I wanted it to be – not bloody and definitely not overcooked to a medium. The rosemary mole sauce was a delicious, subtly spicy sauce that doesn’t overwhelm the beef and I adored the sweet, braised Swiss chard. 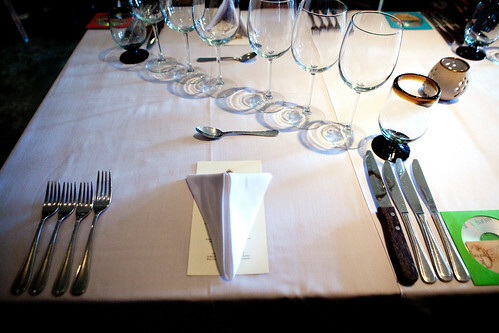 The wine pairing of Roganto Cabernet Franc 2009, a light-medium bodied wine that has aromas of spices such as cloves and pepper in the mouth has good attack and roundness. 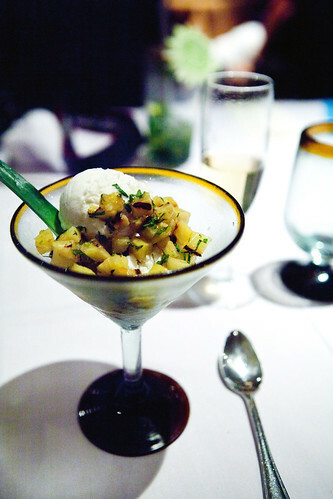 Finally for dessert, we had a very tasty coconut ice cream topped with grilled pineapple, fresh basil, and habanero. The coconut ice cream was incredibly creamy and chewy because of the sweetened flaked coconut mixed within. 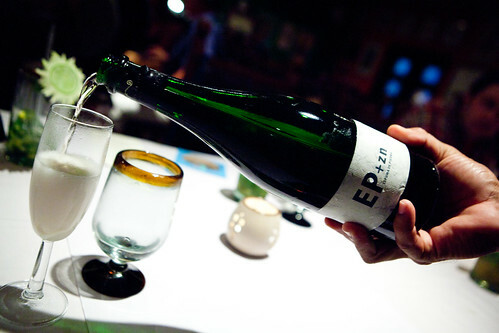 The dessert wine was EP+ZN Espuma de Piedra Zinfandel, a fine, light-bodied, effervescent wine that isn’t overtly sweet like a moscato. 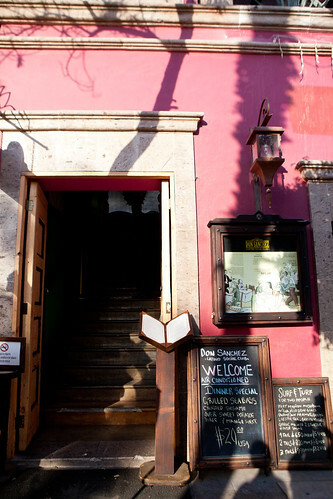 Overall, Don Sanchez is a very good restaurant for dinner out on the historical district of San José del Cabo. The prices are reasonable if you look at their menu, the portions are on the generous side, and the food’s flavor combinations are a bit interesting. My dinner was considered a tasting dinner but the dishes are certainly not multi-course tasting portions (a good thing for the big eaters).